App success has been broadly studied in the literature. This line of research is mainly driven by the significant business interests in the performance of mobile apps. In general, app success can be quantified based on market performance; apps that get more downloads, appear frequently on the top-charts, have steady user acquisition and retention rates, or generate more revenue, are more successful. Failure, on the hand, is a less well-understood phenomenon. Naturally, success is more appealing as an object of analysis than failure. However, market research has shown that failure should be studied in isolation from total prior experience. According to Madsen et al. , organizations learn more effectively from failures than successes. The ability to analyze individual cases of failure represents a unique opportunity for gaining knowledge about what went wrong, the key learning points, and how to prevent such failures in the future. To shed more light on app failure, in this article, we describe a case-study dedicated to analyzing the main reasons that led to the failure of Yik Yak, one of the most popular social networking apps of 2015. Our objective is to model the main users’ goals in domain of Yik Yak along with their relations to the core features of the domain. Models can help to translate tacit domain knowledge into an explicit form. Once explicit domain knowledge is created, it can be preserved, communicated, and passed through to others. anonymity was removed and then restored. Launched in 2013, Yik Yak was a location-based social networking app that allowed users to post and vote on short messages (known as yaks). Yik Yak distinguished itself from its competitors by two main features: anonymous communication and geographical locality; users could anonymously post and engage in discussions within a 1.5 mile radius around their location. The combination of anonymity and locality proved successful, and by the end of 2014, Yik Yak had become one of the most popular social networking platforms on college campuses, with a market valuation close to $400 million. Despite its popularity among users, the anonymity provided by Yik Yak had a downside. Due to the lack of personal identifiability, Yik Yak posts were an easy vector for cyber-bullies to anonymously harass other users at their schools or universities. This problem became significant when the app was used to make threats credible enough for institutions to request police assistance. To control for cyberbullying, Yik Yak rolled out mandatory handles, where users would be forced to choose a screen name. The response from the community to this feature update was overwhelmingly negative. Consequently, the number of downloads and active users dropped sharply. Yik Yak’s attempt to reverse course by reintroducing anonymous posting was never successful in recapturing its previous popularity, eventually, forcing the company to shut down the app and suspend its operations in May of 2017. The story of Yik Yak represents a unique opportunity for analyzing one of the most recent cases of major failures in the app market. To get a systematic in-depth look into this case, we use feature-softgoal interdependency graphs (F-SIG). F-SIGs enable a comprehensive qualitative reasoning about the complex interplay between the functional features of an application domain and its users’ goals. To generate our model, we initially identified the main rival apps of Yik Yak in the domain of anonymous social networking apps. This list included Kik, Jodel, Firechat, Whisper, Swiflie, and Spout. To identify end-users’ goals in the domain, we analyzed user feedback available on app store reviews and the Twitter feeds of these apps . Our analysis was focused on identifying user sentiments toward the core features of the domain . The generated F-SIG model is shown in Figure 2. Fig. 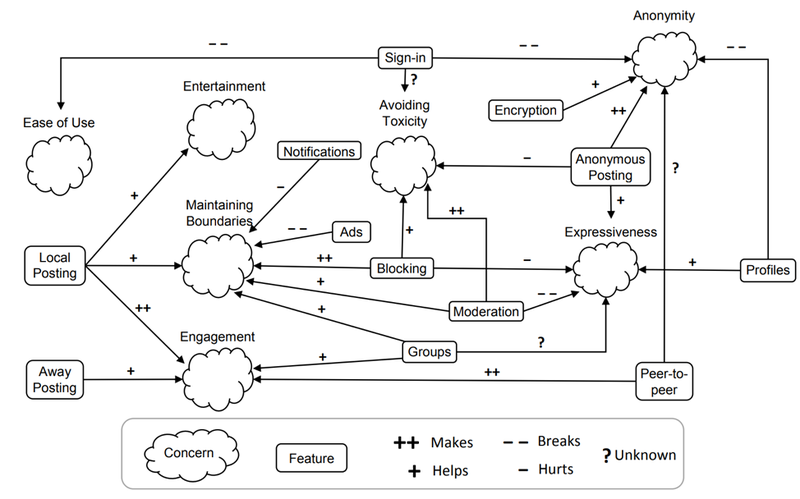 2: A model of the common user goals (concerns) and their relationships to the core features of the domain of anonymous social networking apps. 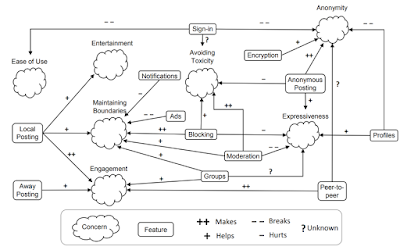 The F-SIG diagram in Figure 2 shows that several in-depth insights can be gleaned from analyzing user goals and their relations to the core features of the domain. Such information can serve as input for the Next Release Problem (NRP), which is mainly concerned with maximizing customer value by optimizing the subset of requirements to be included in the coming release. Furthermore, through the model's dependency relations, developers can get a sense of the synergy and trade-offs between features and user goals, thus can adjust their release strategies to focus on features that enhance the most desirable goals. This information can be particularly useful for smaller businesses and startups trying to break into the app market. Specifically, the proposed model will serve as a core asset that will help startup companies to get a quick and comprehensive understanding into the history of the domain, providing information about how specific user goals and features of the domain have emerged and evolved to their current state. Our future work in this direction will be focused on automating the model generation process, utilizing automatic app store and social media mining methods as well as automated domain modeling techniques. Our goal is to devise automated methods for data collection, domain feature analysis, and model generation. These methods will be evaluated over large datasets of app data to ensure their practicality and accuracy. G. Williams and A. Mahmoud, “Modeling User Concerns in the App Store: A Case Study on the Rise and Fall of Yik Yak,” in IEEE International Requirements Engineering Conference, 2018.
lines. IEE Proceedings - Software, 153(2):6-73, 2006. W. Martin, F. Sarro, Y. Jia, Y. Zhang, and M. Harman, A survey of app store analysis for software engineering, in IEEE Transactions on Software Engineering, vol. 43, no. 9, pp. 817-847, 1 Sept. 2017. P. Madsen and V. Desai, “Failing to learn? The effects of failure and success on organizational learning in the global orbital launch vehicle industry,” Academy of Management Journal, vol. 53, no. 3, pp. 451–476, 2010.